Fr33 Hearts is our CPR awareness program. We’ve given over 300 quizzes so far at events last year. We enjoyed meeting so many people and finding that they knew more about CPR than they thought! 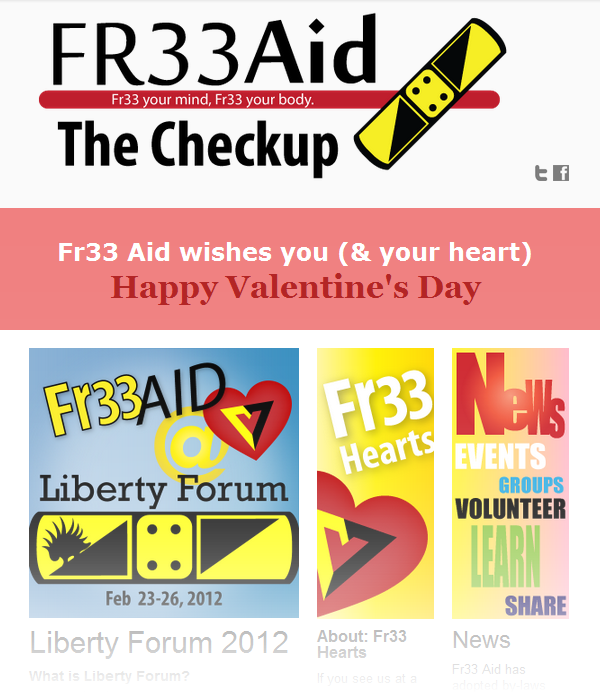 For taking the quiz at our booth, they got a Fr33 Hearts button to show their awareness. If you haven’t already signed up for our newsletter, you can see our new signup box on all our pages as well as the newsletter page which contains our archives! It isn’t on quite a regular schedule yet, but it helps us get the information out there. We also give you the rundown on Liberty Forum, where we’ll be in just a few short weeks. So we hope you’ll check out The Checkup and spread the love. Heart disease is the leading cause of death in places where people have access to fresh water.